GLK250 Review from Gary N.
"Hitch is very nice, well made, pretty straightforward to install. Final installation is indeed stealthy. I do have a couple of comments about the installation. One point about removing bumper is that directly under the tail lights are a crushable plastic mounting part. A guy that has a video on YouTube stated you have to remove the two nuts that hold this on to remove the bumper which is very difficult because this is mounted to the car prior to the bumper going on. This is not true as the bumper will separate from the part, but there are 4 or 5 fingers that have to be released for the bumper to come off. Not impossible, but I think they are designed to not come apart once assembled. I used a large screw driver that I twisted to lift the plastic while pressing the finger down until the lip disengaged. Second recommendation is the power source. Instructions require running a wire underneath the full length of the car and attaching to the battery. The GLK has a secondary fuse block under the rear floor that has numerous open fuse slots. I suggest utilizing one of those with a fuse tap for the power. Fuse 89 is for the factory trailer hitch." Thank you Gary N.! We appreciate your tips and input on your installation experience! EClass Wagon review from Stealth H.
The hitch is completely invisible when not installed on my Mercedes wagon. Plugging in the receiver is very quick and easy. I can have bikes on the car in just a few minutes. I had the hitch installed at the Stealth Hitches headquarters outside of Atlanta and the service there was excellent as well. Steve gave me a short demo of the product and I was on my way. Thank you Stealth H.! We are happy to hear you had a great experience at our Sugar Hill site! GLC300 Review from Tom P.
Stealth Hitches company was very helpful in selecting the correct parts for my vehicle, with any questions I had and with help resolving concerns. The parts arrived VERY well packaged and are superb quality. The instructions for installation could use improvement but I was able to figure it out. If you are not good in the workshop, this one might be better to leave for an experienced shop to install for you. This photo shows a side view of Tom P.'s GLC of the Stealth Hitch installed with ball mount and trailer attached and ready for adventure! 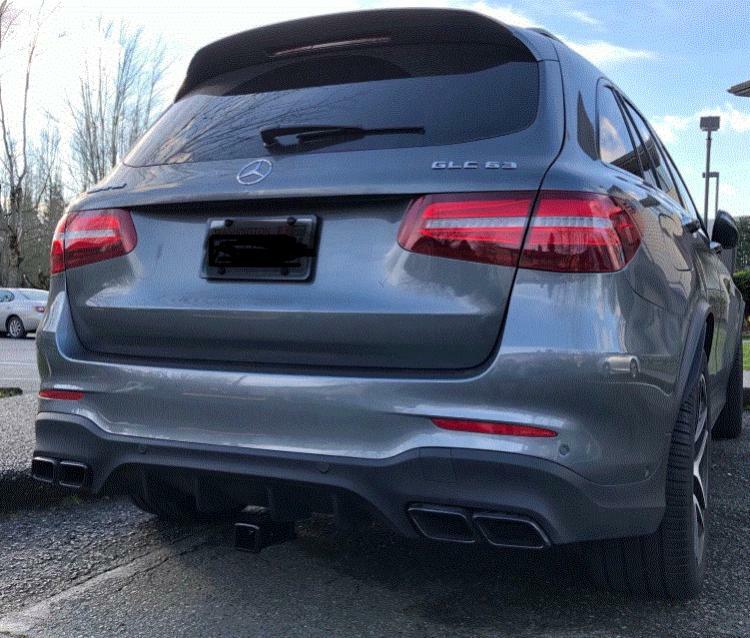 GLC63 Review from James Y. After searching several months for an aftermarket hitch for my Mercedes-AMG GLC63, I finally came across Stealth Hitches. I emailed and called to discuss my needs, and Steve (CEO) called back same day to verify fitment for my car. Talk about great customer service! Based on this, I placed the order and it was delivered, and installed by a recommended installer (Mann’s in Bellevue, WA) who was also terrific. I was concerned about messing up my expensive new car, but the install was very well done and now I have a custom hitch which works perfectly on my GLC. I could not happier with the service, order process, and installation. The hitch itself is SOLID, and the ability to detach it from the car is very slick. I highly recommend Stealth Hitches! Thank you James Y. for your awesome review! We are happy to hear installation went well and wish you happy hitch adventures! The two pictures show a rear view of James' AMG GLC63 with the Stealth Hitch installed and rack receiver attached; and a close-up side view of the rack receiver inserted into the Stealth Hitch. Had it installed at a MB dealership for 2 hours of labor. looks great! E Class Wagon Review from Todd B. Call us a very happy customer! Thank you Todd for your review! Glad to hear all went well!